Finally! 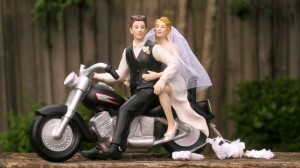 A great cake topper for Harley weddings. Harley Brides will love this! Click here for details on this awesome motorcycle couple. You are cordially invited to become a member of the Harley Davidson Wedding Blog Club. This website is about all things Harley and is devoted to honoring the Harley Bride and all of her wedding plans. How did you make your Harley wedding special? Please share your special plans … memories … and photos to the upcoming Harley Brides! Be sure to check out these wedding cake toppers featuring Harley Davidson and other motorcycles.